I was so saddened to learn about the trial in Tunisia over the broadcasting of the animated movie, Persepolis. The Tunisian revolution which was supposed to be about the overthrow of a dictator will soon descend into a religious dictatorship, if the secular Tunisians remain silent about this sort of thing. Once again, my favourite quote by Edmund Burke "Evil Only Prevails, When the Good Remain Silent" manifests itself in our own times. 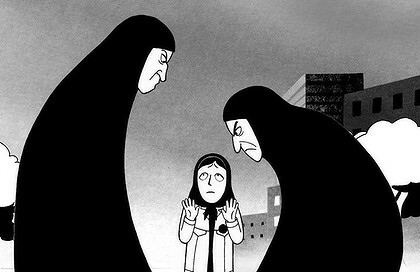 The animated movie, Persepolis, is not about attacking sacred values at all. Only a religious zealot moron could come to such a conclusion. It is in fact a brilliant depiction of how a revolution against dictatorship is hijacked by such extremists. It is a movie that pre-warns ordinary people what will happen if they remain silent and allow the extremists to take over. All Iranians who have experienced religious dictatorship will identify with the Persepolis movie. I remember watching it with my elder son in cinema. When the little girl, the main character of the film, stood up to her teacher, who was regurgitating the official revolutionary propaganda, and delivered the real truth, I was so overwhelmed that much to the embarrassment of my 10 year old, I got up in the middle of the movie and started clapping, only to have my shirt pulled by my 10 year old and be told "we just sit down and watch the movie ok? no clapping". "I am very sad when I see that the people that burned my house are free while I am here because I broadcast a film which was authorised" and he rightly described the trial as the "death of freedom of expression". Unfortunately when Religion becomes Politics, it no longer represents the spiritual word of any God. Only the Earthly greed and ego's of men who try to corrupt it. I too have seen Persepolis and if the Tunisian government is already tripping themselves up in the paranoid bureaucracy of censorship, then it conclusively proves that there is no such thing as 'moderate' religion in politics. -And these days you only have to watch the increasing paranoia and rabid propaganda of the Iranian Regime to know that instead of celebrating rationality, democracy and artistry, it can only feel the bullying begrudgement of the beseiged to try and burn down all the bridges to it. Tunisia be warned.